In the beginning man created flight simulators, then came train, boat, truck and even farming simulators but we may have finally reached the ultimate level with the recently announced and now fully funded through a successful Indigogo campaign) Rock Simulator 2014. With 20 days still remaining in the campaign on Indigogo the team have raised $1,127 of a $500 goal. So the question becomes what do you play whilst waiting for this free to play simulator? That is where I come in, here are my Top 5 games to help you prepare for life as a rock. For the physics and controls. Quite possibly the sketchiest of all game physics lie in obscure simulators but the award for rockiest physics has to go to Woodcutter Simulator 2013. A game in which you spend most of your time questioning if what just happened is even possible let alone realistic. The unrealistic feel isn’t helped by an almost impossible control scheme that has you wondering who felt having to right-click and drag to turn your head in a first person game was at all acceptable or normal. For the personality of a rock. Yes you guessed it. My rants about the miserable Aiden Pearce haven’t ended yet. In this instance though his personality comes in handy. If you’ve ever wondered what it’s like to have the emotional palette of a rock and the personality of a pebble then Aiden is your man. Watch Dogs isn’t the only blockbuster game from Ubisoft to have a boring front man. Assassins Creed 3 also featured a lifeless stump called Connor jumping around in the snow, add to that Jason from Far Cry 3 and you soon see a pattern emerging. From gameplay of AssCreed 4 last year it doesn’t look like they improved the assassins personalities with Edward Kenway. Even gameplay from this years E3 didn’t help them. With the next installments in both Assassins Creed and Far Cry, it seems the problem is spreading to antagonists and NPC’s throughout some of Ubisoft’s largest franchises. Hopefully Ubisoft start writing interesting Vaas like characters again soon. To get used to relying on rocks. Rocks have been used for centuries as tools and building materials so it’s about time you learned to respect the rocks! The Forest may still only be in the early alpha stages, available on Steam through Early Access, yet already you can find a number of uses for the rocks scattered across the island. From making a stone axe to building camp fires and shelters. You can even dig up small rocks to use as projectiles that distract the cannibals buying you valuable time to run away. With updates coming in the future giving you more build options and no doubt some new crafting recipes it looks like rocks will be your best friend for a long time to come. How will it feel to be a rock? Do you know your role in the World? Well don’t worry WWE 2K14 can help you find out what being The Rock is like. You’ll get used to your new name and get used to being as tough as a rock, oh and did I mention you get to beat fools which is always a bonus. Also most of the athletes come out to an upbeat rock based track, back in the old days it would be licensed from artists like Motorhead, Powerman 5000 and Alter Bridge but those days are mostly behind us. The rock influence has stayed though. 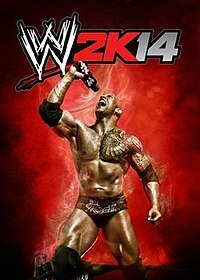 Selecting a wrestling game was a slightly obvious choice but with The Rock being on the box art for WWE 2K14 I felt it was a necessary addition to the list. For the craziness of creating such a thing. So you think a Rock Simulator sounds strange? Are you forgetting about the April fools release from Coffee Stain Studios? Goat Simulator came in at the right time and with just the right attitude. Leave the game pure to it’s ridiculous glitch filled trailer, add in a catchy theme and general goofiness then let people play it. Whilst many games feel like the intention is to line corporate pockets with your hard earned money, this felt like a title with the sole purpose of entertainment and that is what new games are missing, yes they look pretty and yes they normally run smooth but how many are just fall off your chair funny? How many do you replay after your first play through? Goat Simulator has re-playability thanks to its ‘do what you want’ open world attitude. I think the success of Goat Simulator alone proves that silly games still have a large part to play in gaming, even if it’s just something to point and laugh at and whilst it and Rock Simulator both slightly tarnish the ‘Simulator’ name for the realistic simulators like X-Plane and even Euro Truck Simulator it is a price worth paying. If nothing else it gets people into a world away from the bland grey backdrops of generic FPS games and into something more colorful, vibrant and unique. Rock Simulator isn’t to be taken too seriously but I wouldn’t bet against it being a success. Daft ridiculous ideas seem to be able to part people from their money easier than triple A blockbusters. If the team behind it decided to move from free to play and charged even $1 for the finished game I bet they could still be millionaires by the end of the year. As always join the discussion in the comments below or over on Twitter where I’m @PaulMurday.